netkas.org » RomCreator for ATI/AMD cards. Where do I get EFI Rom for 5450? The link brings to posts that discuss Rom for higher cards. I can’t link(s) to ROM downloads. To make this run in 10.6.8, right click the ROM Creator app and select “show package contents”. If you have the Developer tools installed, open the “info.plist” file. 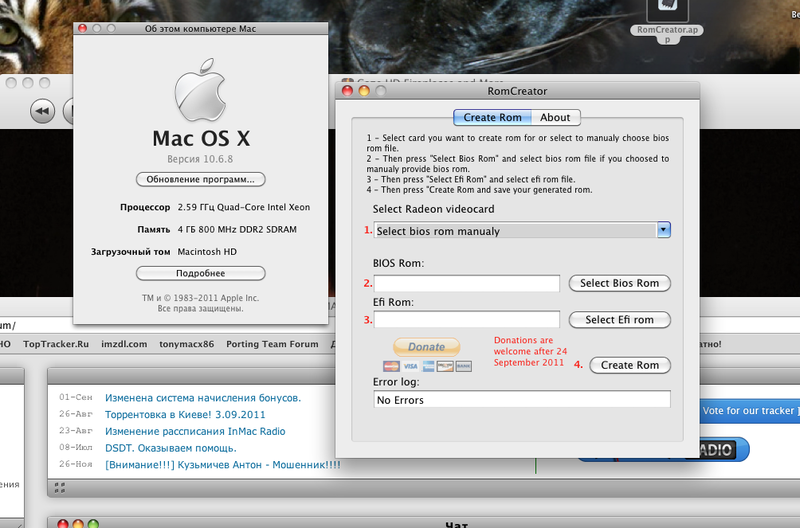 Change the Mac OS build number to “10K540” (without the quotes). Save the file, and launch the app. It now runs in 10.6.8 just fine. а 24 сентября, это потому что на Украину и в Россию пайпал начнет принимать платежи??? hello, is it okay with Lion ? Yes, it’s fine with Lion. It was developed with XCode 4 targeted at the Lion GM build as the minimum OS. It works fine in 10.6.8 with a simple .plist key field modification also. Please someone help us people with the 5450! Thank you! Will this work with HD 5450? Been trying all sorts of things to get my hackintosh video working. Attempted on integrated graphics. Read I need graphics card. Bought the 5450 and still running into problems. I’m sure it can be done somehow. Anyone know about this card? THANKS!!!! Is it possible to save the original rom to disk? hi! I want to ask if its possible to use that to update an iMac 27” Late 2009 from Ati 4850 to Ati 6970m… buy separate part, extract EFI from an original iMac with 6790M and then with a pc machine, install that EFI and then place the video card into my iMac. Since I don’t want to get a bad rom, is it enough to just remove the ATY_init.kext (and maybe rebuild the kextcache…)?